Campbell's Soup, Ample Hills and Sugarfina are all celebrating the world's most famous mouse with delightful Disney treats. Mickey Mouse may be a timeless icon but, it turns out, even famous mice age just like the rest of us. One of Disney World's most recognizable mascots is turning 90 years old this year. On Nov. 18, 1928, Walt Disney and one his animators, Ub Iwerks, premiered a short film called "Steamboat Willie" at Universal Theater in New York City. And just like that, a star rodent was born. 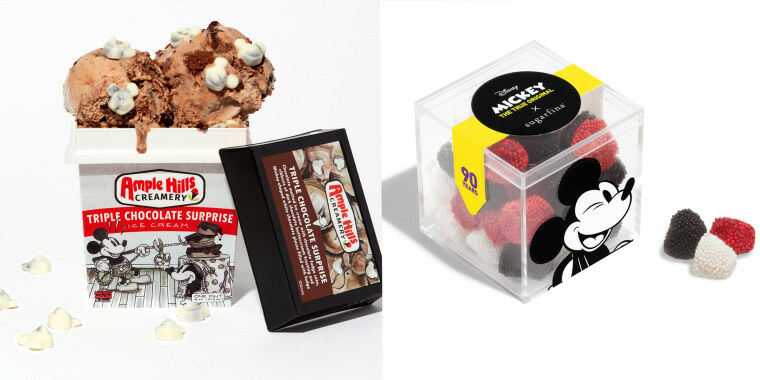 This year, to honor Mickey's major milestone, several brands are celebrating with eclectic collections of limited-edition treats, trinkets and snacks that all honor Disney's classic cartoon. 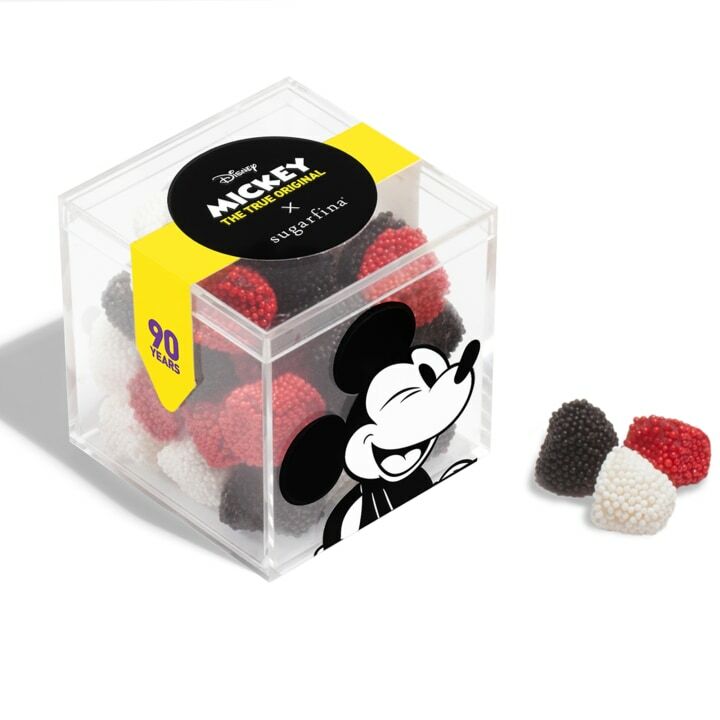 Disney and Sugarfina have partnered up to create the Disney Mickey Mouse 90th Anniversary Sollection, a limited-edition spread of chocolate bars decorated with Mickey-shaped sprinkles and Mickey-themed gummies. Each sweet treat is available in specially-designed Mickey-themed keepsake boxes and there are big collectors' editions available, too. 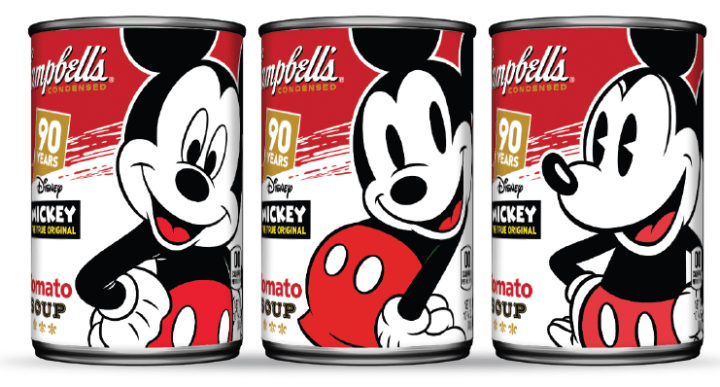 Earlier this month, Campbell’s released new soup cans featuring three different Mickey Mouse designs. The designs show Mickey drawn in the style of three different Disney eras, including the original look from "Steamboat Willie" in 1928, as well as the current version that's more recognizable to millennials. These Campbell's soup cans can be found on shelves at Target right now and will be available through October 2019. Also available for $2 (per bag) at Target. Pepperidge Farm will launch Mickey Mouse Goldfish nationwide on Oct. 1 and they look absolutely adorable. 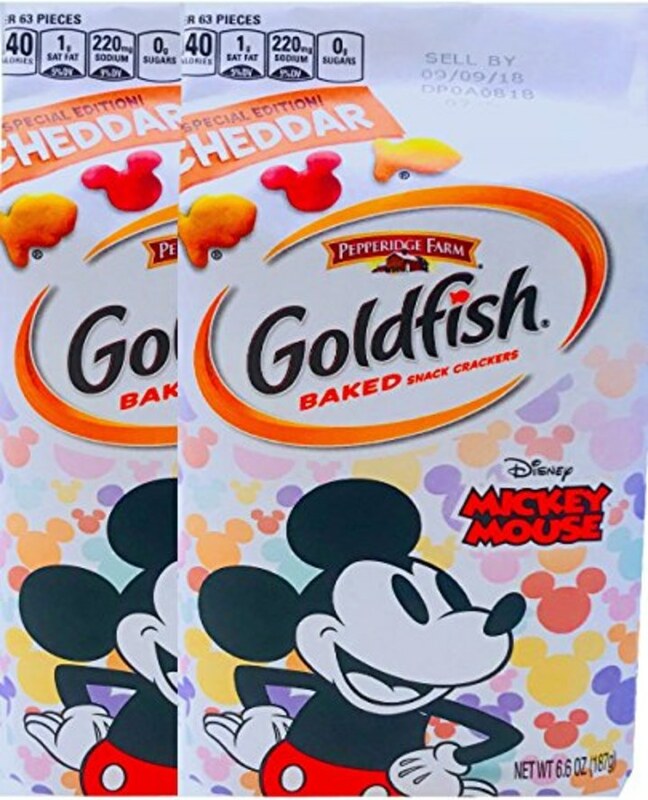 Mixed in with the usual orange Goldfish crackers we all know and love, red crackers shaped like Mickey Mouse will be featured in each package. These special Mickey Goldfish were first launched in Target stores earlier this summer. Get 'em while they're hot (and crunchy!) since the snacks will only be available through October 2019. Lauded by chefs around the world for its durability and beautifully colored products, Le Creuset cookware is the gold standard when it comes to cast iron pots and pans. 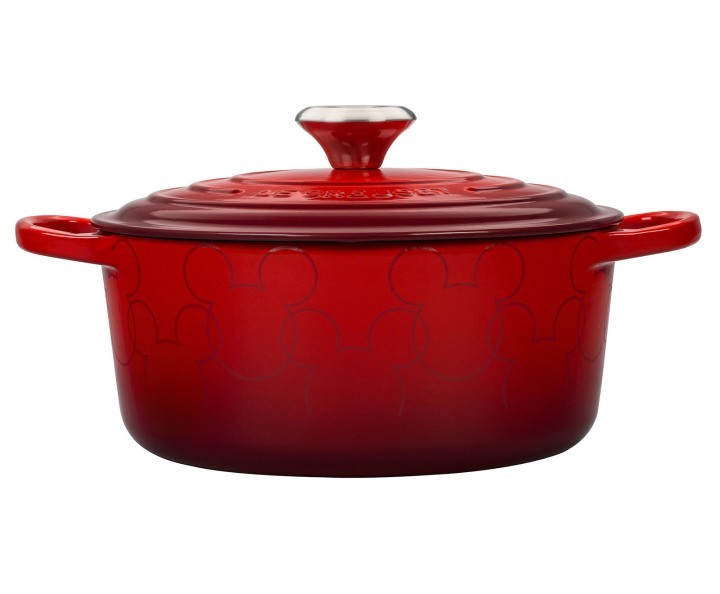 This bright-red Dutch oven features a signature printed base with a little Mickey Mouse carton on the top stainless steel knob. At $350, this certainly isn't cheap but this pot will certainly last the Disney-lover in your life many, many happy meals. For the Disney fan that just can't go anywhere without a memento of his or her favorite mouse, there's this adorable tumbler. Tervis has several Disney-themed drinking vessels, but this limited-edition version features the main mouse himself in honor of his big day. This tumbler will be available online starting Sept. 1. We can always count on Ample Hills to mark important moments in pop culture, whether it’s the royal wedding or the presidential election. In honor of Mickey Mouse’s birthday, the New York-based ice cream maker will be releasing new ice cream flavors as part of its Disney Mickey Mouse Collection. Ready to dig in? The pints include Triple Chocolate Surprise, Confetti Celebration and Peanut Butter Jamboree. Each flavor features sweet, Mickey-shaped chunks of chocolate and is decorated with a Mickey Mouse comic strip.